The Oshkosh Aces MC are a group of people who love to ride. We will ride for charity, fun, or any other positive reason, and represent a diverse cross-section of our community. Our club philosophy is "Live and Let Live" and we honor those who honor us. We respect our Country and our laws, and those who have fought - and are now fighting - to preserve them. God Bless America and those who sacrifice now, and have sacrificed in the past, to keep us safe. We will not forget. Freedom is not free, and we will strive to earn it every day. 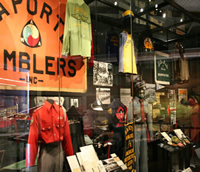 An original club shirt from the Oshkosh Aces MC on display in its new home at the Harley-Davidson Museum. This shirt was also featured on the television show American Thunder, as they showcased the Harley-Davidson archives prior to construction of the museum.